Watermelon Slim has been turning out raw, gravel-throated blues albums for years, and Bull Goose Rooster, his 12th record, is a varied set that bursts with energy. 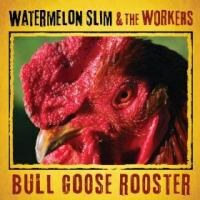 Watermelon Slim has been turning out raw, gravel-throated blues albums for years, and Bull Goose Rooster, his 12th record, is a varied set that bursts with energy. Starting with straightforward, good-time boogie of "Tomorrow Night" and encompassing everything from a cappella devotionals to roof-raising good-time stompers, Bull Goose Rooster delivers a far-flung range of tunes and moods. If there is nothing overwhelmingly groundbreaking about the set, it is nonetheless played with passion and conviction, and that counts for a lot. Opener "Tomorrow Night" is, as mentioned, an uptempo boogie-blues number that benefits from Watermelon Slim's wailing harmonica skronk as well as his unadorned vocals. The titular follow-up tune "Bull Goose Rooster" throws some sweet slide guitar into the mix, courtesy of rock-solid backing band the Workers. In the interests of avoiding a rut, "Over the Horizon" slows the tempo, darkens the mood and brings soulful piano into the mix from guest Dennis Borycki. Vocals from Danielle Schnebelen add atmosphere as well. Throughout the record's 16 tracks, Slim seems wary of staying in one sonic—or psychic—place too long. Not only does the instrumentation shift, but so does the mood of the album, slipping from the wiseass tone of "Trucking Class" and "I Ain't Whistling Dixie" to the almost dirge-like "Take My Mother Home". The fact that these two songs occur one after the other just highlights the album's range. That said, there are plenty of straightforward blues and blues-rock tunes here. The more rocking end of the spectrum is represented by "Vigilante Man", a guitar-centric stomper that wouldn't sound out of place on an album by Foghat or Bad Company. This is Slim’s bread and butter—straightforward rocking blues, or blues-rockers, along the lines of this or "I’m a King Bee" (more killer harmonica!) or "The Wobble" (ditto, and plenty of it). Maybe the two most striking tunes here are the a cappella compositions "Take My Mother Home" and "Northwest Passage". The first is a funeral song that falls somewhere between a spiritual and a dirge—maybe a bit of both—while the other is a traditional ballad, or possibly just a modern song that sounds like one. Telling the story of a ship attempting to find the mythical crossing over the Arctic, "Northwest Passage" shows off Slim's voice to good advantage, something that doesn't always happen with the full force of the band behind him. Both songs are also song with an absolute absence of irony or wiseassery, allowing Slim to show a serious side to his music that is often obscured by his own cleverness. It's not all serious, though, as "The Foreign Policy Blues" attests. Slim is in social commentary mode here, or trying to be, with lyrics that pretend to be incisive without actually taking a specific stand for or against anything. Hey, he's against dictators. That's brave. Smoking riff, though. Not every song is a winner, despite the generally high quality of the musicianship and performances; "Trucking Class", in particular, sounds like a stab at lazy populism, and "Foreign Policy Blues" is an exercise in (lyrical) obviousness. Slim is on surer ground when he delves into the personal, as with the powerful "Prison Walls". But this is quibbling. Bull Goose Rooster is a strong album by a musician who has been paying dues for decades. Listeners interested in hearing the real deal would be wise not to let this slip by.